The arrival of summer is exciting for kids of all ages. Parents may worry though about how to keep their children occupied, active and out of trouble. 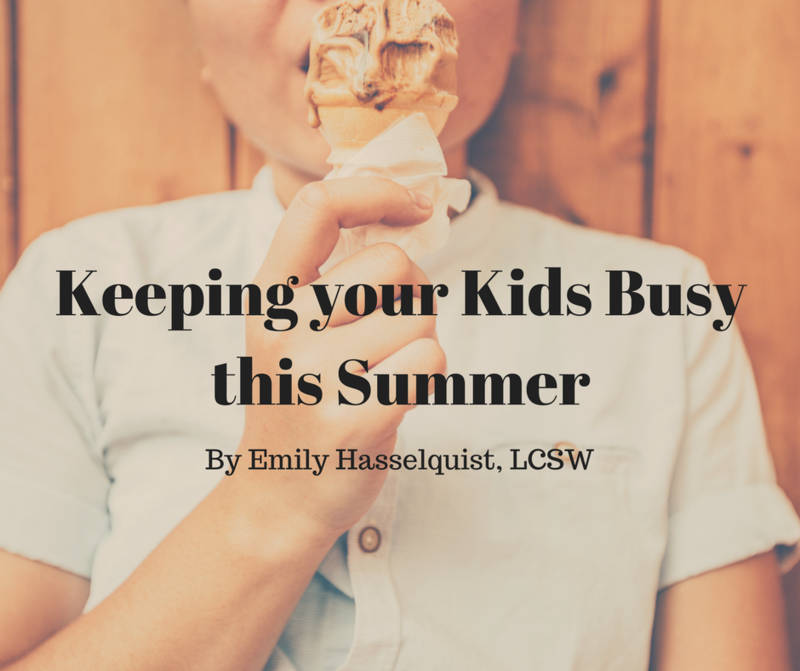 You may find yourself scrambling to keep your kids busy through the months of June, July and August. Below are some ideas on keeping your children happy, healthy and busy this summer. I recently read that children lose an average of 2 months of reading and math skills over the summer. Keep their brains active by encouraging as many learning opportunities as you can. Challenge the entire family to a summer book reading contest and visit the local library often. Encourage your children to try a musical instrument or look into opportunities in the community for kids to learn another language. These are just a couple of activities that may ensure their brains are continuing to grow over the summer. Keeping your kids physically active should be an important part of their summer. Rising temperatures can result in more time indoors playing video games, watching tv and relying on cell phones for entertainment. Break this habit through involvement in sports camps, outdoor games, family walks or time playing at the local park. With childhood obesity growing, it’s even more important than ever to keep your kids active. Encourage healthy eating as well by doing things like planting a vegetable garden or cooking together with your kids. If ‘I’m bored’ is a statement you heard all too often last summer, plan ahead this year. Sit down with you kids early this summer and have them make a list of 25 things they can do when they’re bored. Have crafts, art supplies, sports equipment and books easily accessible. The combination of summer school, sports camps, classes and playdates may get overwhelming. Keep a visible 3 month calendar somewhere in the house for the entire family to see. For older kids, hold them accountable for knowing their schedule. Consider a shared calendar with your partner or coparent so there is no miscommunication about your kids’ schedules. More time together can result in some amazing bonding between your kids over the summer. On the other hand though, you may find sibling rivalry at an all time high during warmer months. Be sure that expectations regarding behavior are understood by all. Rules and consequences for misbehavior must be extremely clear and consistent. Consider letting your children workout their issues on their own rather than having them rely on you to step in and choose a side. Teach and model healthy communication and respect towards one another. By engaging in many of the family activities discussed in the article, ideally your children will remember the positive interactions they had with each other this summer as opposed to the negative ones. Support Gurnee and Lake County by attending some of the great events and activities they have planned this summer. Live outdoor concerts at your local park, roller coasters at Six Flags and a walk through Independence Grove should all be summer bucket list items for your family. Visit some of the websites below for ideas and a calendar of events in the community. From all of the staff at Gurnee Counseling Center, we wish you and your family a wonderful summer!